I love this quote and have applied the sentiment over and over in my practice. Deliberate, patient-centered goals are critical to good outcomes. The process of setting and meeting goals will provide your patients with three specific benefits. Control – When the life or health of a patient is seemingly out of their control, the process of identifying and setting goals that are important to the patient gives them back some power. Focus – Each patient has limited time and energy, so focus is critically important. By identifying the most important goal your patient has and laying out the steps necessary to move them closer to that goal, you give them focal point. Motivation – When patients own the long-term goal, they are more likely to be motivated to complete the necessary short-term goals. So if they really want to be able to play golf again, they need to understand how the short-term goal of completing strengthening exercises every day supports that goal. Reaching each small milestone along the way, provides motivation to continue. A brainstorming session with the patient or caregiver is the first place to start. What is the patient looking to achieve? What is the caregiver looking for as a result – the patient is more independent, stronger or more involved in their care? Set priorities – What is the most important? Identify long term vs. short term goals – Is the goal a long-term one that needs to be supported first by short-term goals? Make the goals visible – Post written goals that the patient can see each day, use a Daily to do list, give patients handouts each week, or use computer apps to set reminders. 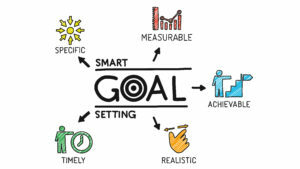 After you have settled on a reasonable goal or set of goals, apply the SMART framework to each. This framework will help your patient further articulate what is important, help measure success and maintain motivation. Specific – What is the desired result? Measurable – How will the patient know it has been achieved? Attainable – Is the goal realistic? Relevant – How does the goal support what the patient wants? Time Based – What the specific time frame for measuring results? Going back to Antoine de Saint-Exupéry and a passage from his novel, The Prince, “If you want to build a ship, don’t drum up people to collect wood and don’t assign them tasks and work, but rather teach them to long for the endless immensity of the sea.” When you tie the goals to something that is important to your patient, results are bound to follow.